Dr. Seuss’ birthday is March 2nd and it is National Read Across America week, which means you only have a few days left to prep for the most rhyme-tastic celebration of the year. 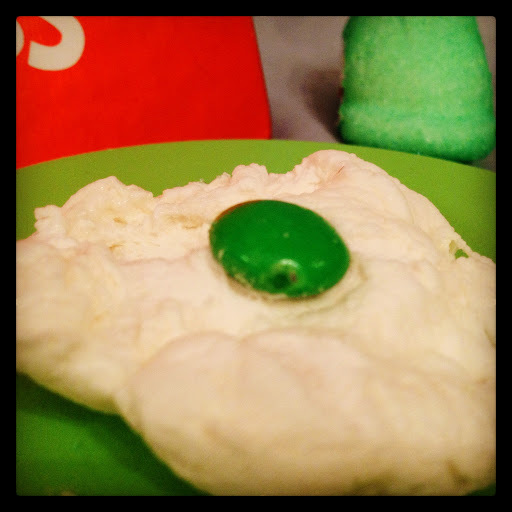 Add a special touch to the day by making (and playing) with some green eggs. Sounds suspicious? Don’t think you’ll like them? Try them! Try them! And you may! Try them and you may I say! 1. Smash up your marshmallow. You’ll want to flatten them as much as possible while still leaving some fluff. 2. Stick a green M&M smack dab in the middle of your marshmallow. It should stick simply from the exposed gelatin of the marshmallow. 3. Serve with a side of silliness. Only let the kids eat the “eggs” in the dark, in a box, or with their favorite stuffed fox!